Protect yourself from cold and wind when working with this warm, flexible and lightweight jacket. 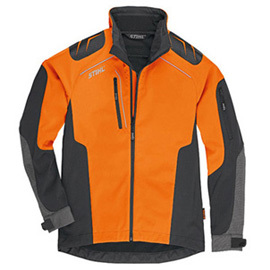 Highly breathable and quick-drying with waterproof hi vis orange panels and water repellant dark panels.Highly elastic, fast drying and warming. Functional zones: Black areas are water-repellent and breathable, coloured zones are waterproof and breathable, chest and inside pocket and abrasion protection on the shoulders.